8 oz / 237 g – or Travel Size 0.5 oz / 15 g .
*Aloe Barbadensis (Aloe Vera) Leaf Juice, Cocos nucifera (Coconut) Oil, *Unrefined Theobroma Cacao (Cocoa) Seed Butter, *Unrefined Mangifera indica (Mango) Seed Butter, *Unrefined Butyrospermum parkii (Shea) Shea Butter, *Prunus avium (Cherry) Kernel Oil, *Persea gratissima (Avocado) Oil , *Olea europaea (Olive) Fruit Oil, Cetearyl Olivate and Sorbitan Olivate (Natural Olive Oil Emulsifier), Tocopherol (Pure Vitamin E), *Kosher Certified Vanilla Flavor Oil (Naturally derived from plant/fruit material) and Natural Antioxidant Preservative (Antioxidant fruits, berries, and tea tree). The butter is super thick, almost like icing and it leaves my skin so super soft. I use it all over my body and it’s very nourishing, great for winter after a bath! The scent is to die for! 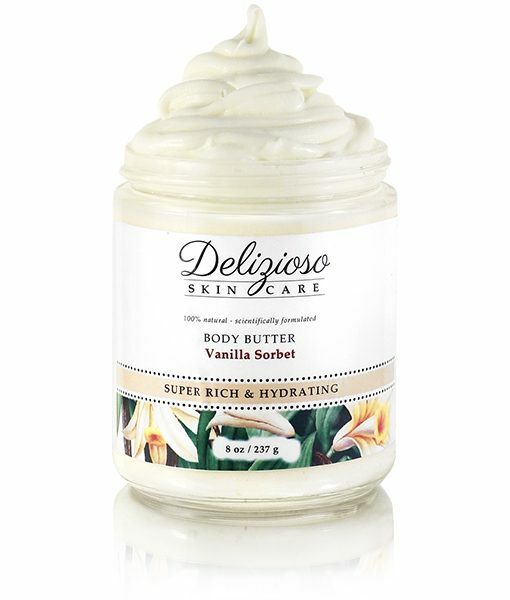 This is seriously the most delicious vanilla I have ever tried and not to mention how hard it is to find organic products scented with vanilla. I have to resist eating it out of the jar! Will definitely recommend. Love this one, smells soo sooo amazing! Like delicious but not overpowering vanilla with a hint of cocoa, so yummy! Hard to use this on my body rather than eat it. Also, makes a great moisturizer. I cannot live without this body butter, from the ingredients, to all the wonderful scents! I am a fan for life, this is the only body moisturizer I will ever buy! Thank you, Delizioso!! I wasn’t expecting this to smell like a vanilla cupcake, but my goodness it does and I love it!!! It makes my skin so soft and the smell lingers for a good minute.